"It's been a lot of fun," Ken Griffey Jr. said. "It was awesome. Never in my wildest dreams did I think I'd ever accomplish something like this. All the aches and pains that I've had this year were gone while I rounded the bases." Junior went exactly one week between hitting his 499th and 500th home runs, but the landmark blast couldn't have come on a better day. 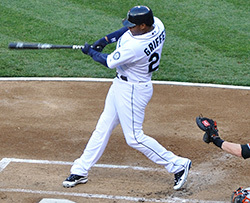 Hitting the homer on Father's Day was the perfect way for Junior to end his quest, considering that he and his dad, Ken Griffey Sr., are probably the most famous father/son duo in Major League history. Following the 393-foot solo blast off Cardinals right-hander Matt Morris in the sixth inning of a 6-0 Cincinnati win, Junior was immediately swarmed by his teammates, but he didn't waste any time making his way to his dad, who was sitting right next to the Reds dugout. "It's been a great Father's Day for me," Griffey Sr. said. "I had my grandkids sitting there watching the game and I enjoyed every minute of it." Before Boston's May 31, 2008 game against the Baltimore Orioles, Red Sox outfielder J.D. Drew asked his teammate Manny Ramirez if his 500th homer would be an inside-the-park job. "I know what you want to know," Ramirez replied. "You want to know when am I going to hit the 500? Don't worry about it. I hit it one day." Ramirez knew it was only a matter of time before he reached the landmark. When Man-Ram launched #500, a 410-foot solo blast to right-center -- with two outs in the top of the seventh inning -- he fulfilled on his promise and bolstered Boston's lead to 5-3 in a game it went on to win, 6-3. 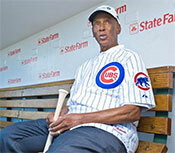 In doing so, he also boosted him to the ranks for baseball's most exclusive club. "As soon as I hit it, I knew it was gone. I was happy to move on," said Ramirez. "It was great. I've been trying so hard the past three weeks just to get it done. It finally came, and I'm happy. I'm proud of myself and all the things that I accomplished. So now I can go and have fun." As Ramirez was mobbed -- first by close friends David Ortiz and Julio Lugo, then by the rest of the bench -- as his wife, Juliana, sat in the stands and cried. "It was a big hit and I knew I had done two things,” observed Eddie Murray after hitting his 500th career home run on September 6, 1996 off of Tiger pitcher Felipe Lira. “It tied the game and we need some wins.” The Camden Yards crowd responded by giving Murray a nine minute standing ovation and a banner reading, “CONGRATULATIONS EDDIE 500" was lowered over the ivy covered wall in centerfield. "A-Rod" Alex Rodriguez didn't let the media circus surrounding his meteoric rise up the home run leaders list keep him from enjoying the moment, when he smashed magical #500 on August 6, 2007: "I acted like a goofball running around the bases, but you only hit 500 once," he said after the New York Yankees beat Kansas City 16-8. Considering his meteoric rise towards the top of the all-time home run list, it's not surprising that - immediately following achieving his goal of being the youngest player to hit 500 MLB home runs, "A-Rod" was peppered by media questions about his ability to challenge Barry Bonds for the Home Run Crown. "I'm not going to starting think about what my destination is," Rodriguez said. "I have a tremendous passion to play winning baseball and play baseball the right way. Let's take it one step at a time." 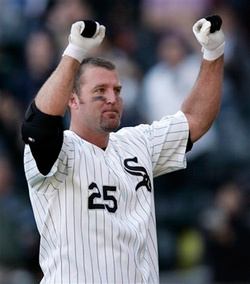 Jim Thome joined the club with style with a two-run WALK-OFF shot in the bottom of the ninth inning to give the Chicago White Sox a 9-7 victory over the Los Angeles Angels. "It's amazing, it really is–like a movie script," Thome said. "I would never have imagined doing it in that situation." The September 16th blast was "The Thomenator''s" 28th of the season and made him the 23rd member of the 500 Home Run Club®. Afterward, the Chicago White Sox DH raised his arm in the air as he rounded the bases, and he was mobbed by his teammates at the plate before he hugged his father and wife. I said, "Let's just get a hit right here.' That's when home runs happen, when you're really not trying to do too much," said Frank Thomas after hitting #500 on June 8, 2007. Thomas shook his head in amazement when he thought about joining the likes of Hank Aaron, Barry Bonds, Babe Ruth, Willie Mays and Harmon Killebrew in the 500 club. "It's an unbelievable class of talent," he said. "I saw a lot of them play. I have the utmost respect, and I'm very happy to be here because it takes a long time to hit 500 home runs and I think I've paid my dues long enough through numerous injuries. 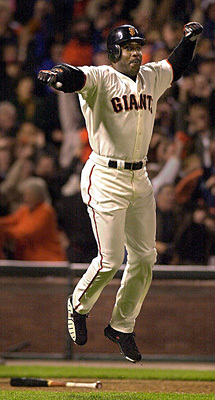 After reaching a career home run total of 495, Bonds went on an unprecedented tear, going deep in four consecutive games to reach the brink of the magical 500 home run plateau. After hitting his 499th home run, Bonds struggled to get Number 500. “I had stage fright for a while and had to get back into my game. It was great having my father and McCovey and Mays around me on a daily basis to put life in perspective for me and they told me ‘You gotta get back in the game and block this stuff out.’ Sometimes that's easier said than done though. It's tough to go up there and feel like you're onstage by yourself and feel like nobody is around. It's a nerve-wracking feeling and I'm glad it's over." “500 was not that big a deal to me because I did it on the road in Houston,” observed Bonds' Godfather Willie Mays, years after the fact. At the time, I was more intent on helping to get my team to the post-season. Despite his professional demeanor, the “Say Hey Kid” recalls that it meant a lot to him to see legendary pitcher Warren Spahn (who had given up the first home run of Mays career) there to greet him as he returned to the dugout. "Warren asked me if it was anything like the same feeling of my first home run, and I told him it was exactly the same feeling." While some would argue that every home run Babe Ruth ever hit was “big,” even “The Bambino” himself was impressed by the achievement of hitting No. 500. Batting at League Park in Cleveland, Ruth hit record his 500th career home run. 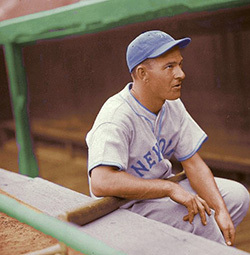 After Ruth hit the Indians’ Willis Hudlin's first delivery in the second inning over the right field fence onto Lexington Avenue outside of Cleveland’s League Park, he told Detective H.C. Folger, "I'd kinda like to have that one." The detective found the young boy who had caught the ball and brought him to meet the sports biggest star. The boy exchanged the historic ball for an autographed ball and a twenty-dollar bill, and was quoted in the next day’s newspaper as saying, "Gee, Ruth's a swell guy." When asked what it felt like to hit his 500th home run, Banks said: "When you catch it right, it's a perfectly wonderful feeling. It's one you continuously want to have. You practice, you change bats, change stances, get a little more history on the opposing pitcher, all in search of that feeling. It's a feeling that's unbelievable when you hit the ball right and it goes out of the park. Then, when you round the bases, the feeling is still there, the memory of it. When you touch home plate, it's still there. When you get to the dugout, it's still there. It lingers throughout the game, throughout your ride home. I'm telling you. It's amazing." April 4th 2003 started out as a rough day for Sammy Sosa, but ended as one that he will never forget. After getting hit by a pitch, striking out and flying out, Sosa lined a 1-2 pitch from reliever Scott Sullivan in the seventh inning into the seats in right field, touching off a standing ovation from the crowd and his family members as he rounded the bases. Then Sosa came out for a curtain call as the 29,048 fans kept on cheering. His mother, wife, brother and four close family friends accompanied him from New York, where he barely missed hitting No. 500 against the Mets. He raised his arms in celebration and gave his trademark home run hop as soon as the ball left the bat and headed for history. He then dropped his head, circled the bases and raised both index fingers as he touched home.